David 'DJ' Creato, (2nd from right), appears in Camden County Court on Wednesday, April 19, 2017, on charges he killed his son, Brendan. A jury of 11 women and three men were selected shortly after noon Wednesday in the Brendan Creato murder case. The trial will begin at 9 a.m. Thursday with opening statements in Courtroom 42 of the Camden County Hall of Justice before Superior Court Judge John T. Kelly. Philadelphia lawyer Richard J. Fuschino Jr. will speak on behalf of defendant David "DJ" Creato, Brendan's father, 23. Creato is charged with killing his three-year-old son to further his romance with his then-17-year-old girlfriend, Julia "Julie" Stensky. Stensky, named as a potential witness, and Creato exchanged more than 9,000 messages. A Pace University student in New York at the time of Brendan's death on October 13, 2015, the Feasterville, Bucks County resident frequently expressed resentment of the child, according to prosecutor Christine Shah. Stensky had identified herself and Creato as murder suspects in a since-removed online post. She had worked for a time at a home improvement company operated by David Creato Sr., Brendan's grandfather and DJ's dad. She was not charged in the case. Stensky left college to join the Air Force. 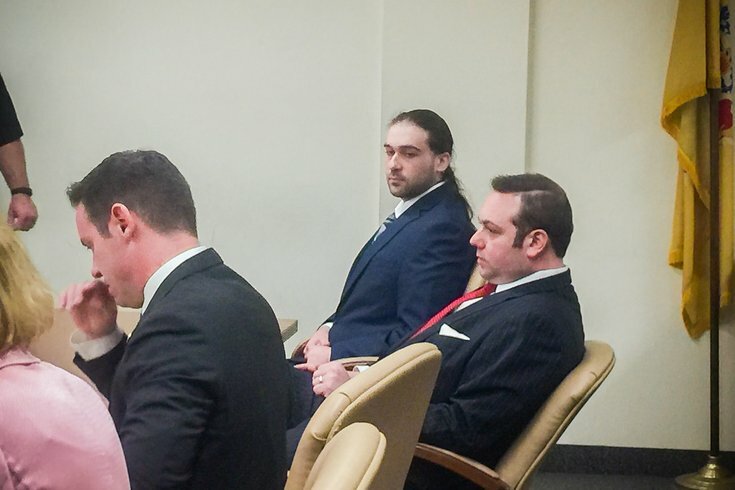 Shah will make the prosecution's opening statement, which is expected to center on Stensky's dislike of Brendan and DJ's jealousy, captured in the text messages. She will also likely outline the unlikelihood that the boy walked alone in the dark to where his body was found – while his socks stayed clean. Neither Fuschino nor Shah made any comments once the charge to the jury was made. The panel was dismissed for the day at around 12:30 p.m. Hundreds of potential jurors were assessed over two days to select the 14 jurors. 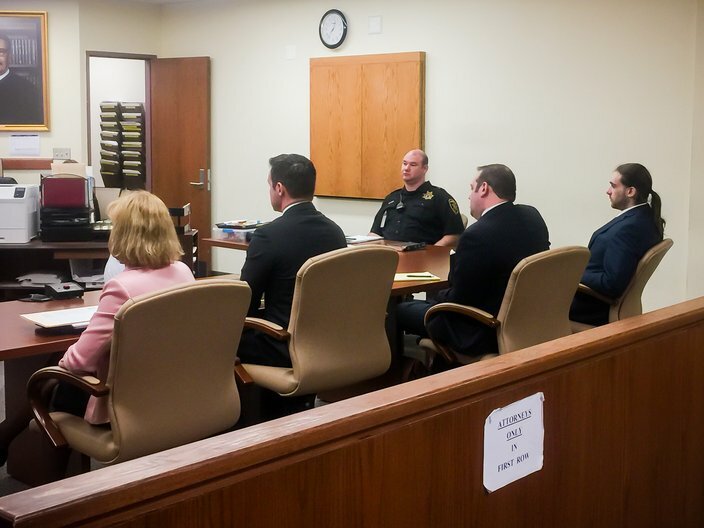 Appearing in Camden County Superior (from left to right, facing away), Camden County Prosecutor Christine Shah, Assistant Camden County Prosecutor Kevin Moran, Attorney Richard J. Fuschino, Jr., and David 'DJ' Creato. After trial testimony is concluded, likely near the end of May, two jurors will be designated as alternates and the remaining 12 will decide the case. Shah has called it a strong circumstantial case; there is no DNA evidence nor any apparent eyewitnesses. The boy's mother, Samantha DeNoto, shared custody and lived elsewhere, but Brendan was in the care of his father on the evening of Columbus Day, Oct. 12, 2015. Around 6 a.m. the next morning, DJ Creato called 9-1-1 to report his son as missing. During the emergency call, on which his DJ Creato's mother, Lisa Creato, is heard in the background, the father suggested the toddler, who slept on a sofa in the living room of the apartment, may have let himself out and wandered away. A community-wide search concluded around 9 a.m. when a police dog handled by a Delaware River Port Authority corporal caught the boy's scent and found his body in a stream flowing toward the Cooper River. The child was stomach down on a rock, his arms and legs dangling into the water, his head turned to one side, his hair damp on one side. He wore only clean white socks on his feet. The creek is in Cooper River Park, just a bit more than a half mile from the apartment. Shah has tentative approval from the judge to take the jury to the scene where the body was found. She is expected to tell the jury the child could not have made the trek alone in the dark, and get there without dirty socks. After three autopsies of Brendan Creato's body proved largely inconclusive as to precisely what caused the boy's death; it was "homicide, etiology unknown" ruled Medical Examiner Gerald Feigin. Investigators returned to the small stream soon after the three autopsies and attempted to replicate conditions when Brendan died. They even had a child of about Brendan's size don white socks to approach the creek. They also studied water levels; the stream rapidly rises and falls depending on precipitation. A fallen tree and a large memorial display in Cooper River Park were removed last Saturday, in apparent anticipation of the possible jury visit. The judge has not said when he might grant final approval for the scene visit or precisely when the trip would be scheduled.